I could read all day long. To myself. To my kiddos. I just LOVE reading! I try to sneak in teachable moments at every possible opportunity I can. That includes read-aloud time. I "map out" (loosely) my read-alouds for the year on my planning calendar so I have an idea of what I want to read when. I include one chapter book per month. The rest of the month's read-aloud time is devoted to a particular author. This gives me the best of BOTH worlds. An opportunity to share those GREAT can't-wait-to-read-the-next-chaper-to-find-out-what's-going-to-happen BOOKS, as well as digging into an author's craft. When we get to our author-of-the-month, I like to provide my students with a little background on the author. They love to know that he/she used to make books with paper and yarn as a child, or that he/she couldn't read until the fifth grade, or that he/she NEVER thought they would grow up to write books! You can find some of my author background PowerPoints here for FREE - just look for the "FREE SAMPLE" buttons! I also like to create a little bulletin board area/space to hang a picture of the author, display some of his/her books, and have an area where we can track the author's "fingerprints" - you know those things that he/she does that sets him/her apart from other authors. I adore how the kiddos gobble up the author's books from there on out! I revamped my author signs and thought I'd share them here as a freebie in case you wanted to use them, too. This is just the first round - more to be made...if you would like to request one for a specific author, leave a comment below and I'll try to include him/her in the next batch! Click below to download the FREE Set of 10 Author Signs. Feel free to pin them so others can find them to download, too! These are AWESOME! I have an "Author Spotlight" section in my classroom library and these signs are BEGGING to be included :) Thanks for sharing, Amanda! I LOVE THEM! Thanks so much for these posters. I notice that my students are always into an author or series after I have highlighted them or used their books. FYI Robert and I live in the same city! These are so great! My 2nd graders are getting ready to do group author studies and I was having trouble narrowing down authors for them to pick from. I also didn't have any visuals for each author... This is exactly what I needed! Did you read my mind?... :) Thanks so much for sharing! These are WONDERFUL! My fivers are always interested in authors. Just today we were reading Shel Siverstein's poems (and giggling a LOT) and they were asking for pictures and information about him. What a great addition to Language Arts lessons! Thanks for sharing! These are great and I love Robert Munsch books! Thanks for sharing! These posters are fantastic- what a great way to get to know these authors- thank you! I need to do a better job at mapping out my read alouds! What a great freebie! Author's Studies are such a great way to get students motivated to read. What about adding Mo Willems? Love these posters! 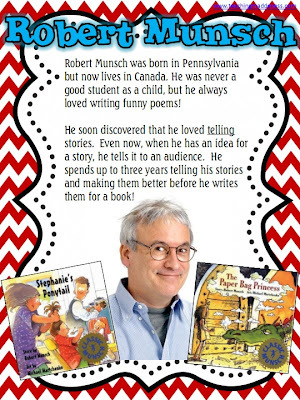 Robert Munsch is awesome! I love to read his books to akk my students even the big ole' 5th graders! Thank you so much for your ideas and lessons. 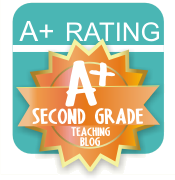 Please consider taking a moment to log in and vote for my friend, Klare McKee, in the Georgia Star94 Top Teacher contest! Hi Amanda! I love these so much I printed and laminated them to use for next year. I plan to have an Author Study bulletin board. I agree with the person above who said Mo Willems would be a great addition! Thanks so much for these! I am in the process of making Spotlight on the Author bookmarks for my kids this year, and these will be a nice complement!! :0) As always, thanks for your hard work! 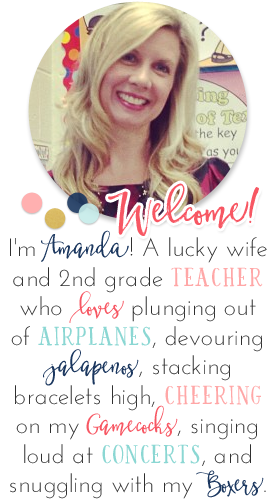 I just found you and your Meet the Author posters are just what I was going to make myself! But you did a much better job than I would have. 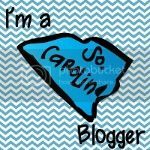 I am excited to meet you even if it is only on your blog! These Meet the Author posters are wonderful! I can't wait to use them in my classroom. Thank you! I love these!! One of my favorite read alouds for 2nd/3rd grade is The Mouse and the Motorcycle. I love doing the different voices! I'm in love with these posters. Thanks bunches for sharing!!! I love these! These are some of my very favorite authors! Thanks for sharing. Thank you so very much! I love the posters and want more!!!! Please let us know if you are making more of them. I will buy them from your TPT store. I would love to request Jerry Pinkney, Nikki Grimes, and John Steptoe. Thank you for sharing both sets of these wonderful signs! I also just browsed your TPT store and have put several items on my wish list for later in the year. Thank you again! Thank you Amanda for granting my request for more posters (grimes, pinkney, & steptoe)! WoW!! thank you so much for this freebie...it is absolutely perfect...the amount of time and care you put into your author signs pack is unbelievable...i will be printing this pack and using it in my grade 3 classroom this fall...i am also your newest follower on both your blog and tpt store...thank you!! Can I purchase the Grimes, Pinkney & Steptoe posters from your TPT store soon? What part of the day do you have your author studies? Is it during your language arts time? Another time during the day? Do you have activities to go along with the study or do you just read aloud the books? Trying to figure out how I can incorporate this in an ready jam packed schedule! Wanted to have a look at the Author Background PowerPoint's but when I clicked on the "here for FREE" link it took me to another page but there was no "FREE SAMPLE" heading. Is the link old and since been removed?